I hate to walk into a beautifully done bathroom only to see some cheap plastic bottle with bright colored stickers totally ruining the bathroom mojo. So herein lies my reason for the excitement behind my new soap. I mean, honestly, the packaging is beautiful--simple and classic...even with a cow on the front. And it smells heavenly. 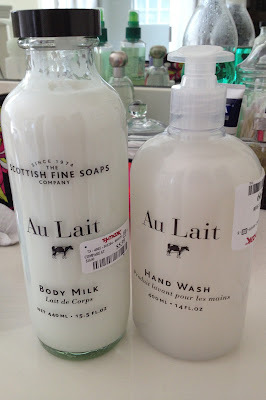 Naturally, I had to pick up a bottle of the body milk (lotion) as well. I can't resist a good glass bottle. And you know what else is great about these two? Their price! I always love to know how good of a deal I score, so, in the words of my husband, I "took it to the Googledome." I found both on Amazon, albeit for a much larger price tag.